There are some basic things that everyone needs to do when building lean muscle – it’s the same for everyone, and there are no shortcuts. If you want to know how to burn fat build muscle fast, it takes work, diet, and a good attitude to build lean muscle and keep your body healthy. Some people build muscle easily; it may take more time for others, but the goal is worth the effort. Here are some tips to get your body building lean muscle. 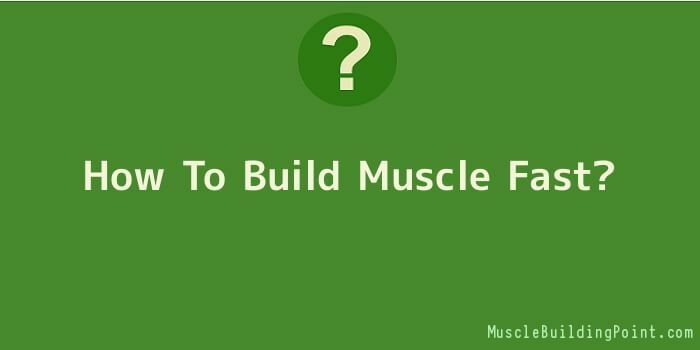 If you want to build up your chest, add some more curve to your calves, or just add bulk to your body in general, you will love the following tips on how to build muscle fast. The only sure way to add significant amounts of muscle is to actually tear the fibres in those muscles, in the appropriate way, of course. How can you do that? Your muscles need to be worked hard, physically, through some sort of hard activity. Unless you are very active every day, or you work some type of job in manual labour, you need to get yourself some weights. Dumbbells, barbells, and other types of lifting machines, can be used to give a huge amount of progress with building muscles. No, you do not need to develop extra joints in your body. Unless you already have a lot of muscles, exercising with movements that only incorporate one joint, such as triceps extensions and bicep curls, will not build muscle very fast. Rather than doing these sorts of exercises, you need to make use of multi-jointed exercises, such as dead lifts, cleans, bench pressing, and squats. These not only work a greater amount of muscles, in the same amount of time, but they can also help you to use more weight than you would be able to use for single-joint workouts. If you really want to build up muscles, you need to understand the importance of using enough weight. Many people do not use adequate amounts of heavy weights when they are trying to bulk up, but this is a big mistake. Of course, you do not want to go overboard and injure yourself. For each set, you should be aiming to lift around 8 to 12 reps, and doing 3 to 8 sets for each individual exercise. Each set should end with noticeable muscle failure, or you probably are not lifting enough to really add muscle. A reason that committed bodybuilders’ workout with partners is that they need a “spotter” to help out if the weight becomes too much for them to lift alone, or properly. This is why it is important to lift with a partner. However, if you cannot find someone to spot for you, it is safer to just stop when you start to experience muscle failure. You might not get quite the same benefits from doing this, but at least you will not risk injuring yourself in any serious manner. Remember that weights are heavy enough to even be fatal if dropped on a vital area of the body. Just rest for a few seconds, and then keep going and finish of your set, so that you do not make a mistake. In order to build up muscles, your body needs a certain amount of calories However, if you choose to go running or bicycle riding, your body is going to be burning up calories that could be used to build muscles. While cardio is a good idea for an overall fitness routine, it is not advisable when you are focusing on adding muscle fast. If you want the best results, you should just use a few minutes of cardio as a warm-up for your weight training routine. You are trying to add muscle to your body; you are not trying to diet and slim down. In order to add a single pound of muscle, at least 3,500 calories must be eaten. A realistic amount of muscle growth per week is 1 or 2 pounds, so you should aim to consume 500 to 1,000 calories more than usual every day, so that you are having 3,500 to 7,000 calories extra every week. Instead of just trying to eat as much as possible, and loading your body with a bunch of random things that you think might help you to gain muscle mass, find sources of good protein that you can use to make up your weekly calorie count. This includes things like beef that has been fed on grass, good fat sources like coconut milk and avocadoes, and yams or sweet potatoes for a source of good carbs. There are a lot of different supplements out there to help people build muscles. However, you should choose something that is full of good ingredients. Two supplements that you should get a hold of are a supplement containing creatine, and a supplement with good quality protein, in powder form. Other types of commonly used supplements include beta-alanine and nitric oxide, which can give you similar results to the aforementioned supplements. Working hard and doing the right actions are important for muscle growth, but you have to remember that rest is essential too. When you exercise, you are actually damaging the fibres of your muscles, and they will grow by repairing themselves. To build muscles fast, you have to cause fatigue to a group of muscles, and then you need to allow them enough time to properly rest and recover. A muscle will generally require a minimum of 72 hours in order to fully repair after a workout. A rule of thumb is to wait until there is absolutely no soreness in any muscle before you workout with it again. As an example, if you work your chest and shoulders on Tuesday and Friday, do leg workouts on Wednesday and Saturday, and arms, abs, and back workouts on Thursday and Sunday, you are rotating which groups of muscles are being used.